by Marieb, Elaine N.; Smith, Lori A. For the two-semester A&P laboratory course. The #1 best-selling Human Anatomy & Physiology Laboratory Manual helps students and instructors manage time inside and outside of the A&P lab classroom and works hand-in-hand with Mastering A&P, the leading online homework and learning program for A&P. The 13th Edition features dozens of new, full-color figures and photos in the review sheets, as well as revamped clinical application questions and critical thinking questions that reinforce the most important concepts from lab. Encourage students to prepare for lab by assigning recommended Mastering A&P activities for each lab exercise, including 18 pre-lab videos (8 are new to this edition), Building Vocabulary Coaching Activities, exercise review sheet assessment questions, art labeling activities, mobile-ready Practice Anatomy Lab™ 3.1 with customizable flashcards, and more. Thousands of assignment options in the Item Library are closely correlated with the print edition of the manual, making it easier than ever to create homework assignments that are aligned with your lab activities. 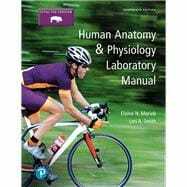 Continuing to set the standard for the 2-semester A&P laboratory course, the lab manual complies with the illustration and presentation style of the best-selling Marieb/Hoehn Human Anatomy & Physiology text, but can accompany any A&P textbook. New customization options are available through Pearson Collections, as well as three conventional versions: Main (12th Edition), Cat (13th Edition), and Fetal Pig (13th Edition). Mastering™ is the teaching and learning platform that empowers you to reach every student. By combining trusted author content with digital tools developed to engage students and emulate the office-hour experience, Mastering personalizes learning and improves results for each student. Mastering A&P assignments support interactive features in the lab manual, including pre-lab video coaching activities, bone, muscle, and dissection videos, Dynamic Study Modules, Get Ready for A&P, plus a variety of Art Labeling Questions, Clinical Application Questions, and more. Note: You are purchasing a standalone product; Mastering A&P does not come packaged with this content. Students, if interested in purchasing this title with Mastering A&P, ask your instructor for the correct package ISBN and Course ID. Instructors, contact your Pearson representative for more information. For Elaine N. Marieb, taking the student’s perspective into account has always been an integral part of her teaching style. Dr. Marieb began her teaching career at Springfield College, where she taught anatomy and physiology to physical education majors. She then joined the faculty of the Biological Science Division of Holyoke Community College in 1969 after receiving her Ph.D. in zoology from the University of Massachusetts at Amherst. While teaching at Holyoke Community College, where many of her students were pursuing nursing degrees, she developed a desire to better understand the relationship be-tween the scientific study of the human body and the clinical aspects of the nursing practice. To that end, while continuing to teach full time, Dr. Marieb pursued her nursing education, which culminated in a Master of Science degree with a clinical specialization in gerontology from the University of Massachusetts. It is this experience that has informed the development of the unique perspective and accessibility for which her publications are known. Dr. Marieb has partnered with Benjamin Cummings for over 30 years. Her first work was Human Anatomy & Physiology Laboratory Manual (Cat Version) , which came out in 1981. In the years since, several other lab manual versions and study guides, as well as the softcover Essentials of Human Anatomy & Physiology textbook, have hit the campus bookstores. This textbook, now in its 11th edition, made its appearance in 1989 and is the latest expression of her commitment to the needs of students studying human anatomy and physiology. Dr. Marieb has given generously to colleges both near and far to provide opportunities for students to further their education. She contributes to the New Directions, New Careers Program at Holyoke Community College by funding a staffed drop-in center and by providing several full-tuition scholarships each year for women who are returning to college after a hiatus or attending college for the first time and who would be unable to continue their studies without financial support. She funds the E. N. Marieb Science Research Awards at Mount Holyoke College, which promotes research by undergraduate science majors, and has underwritten renovation and updating of one of the biology labs in Clapp Laboratory at that college. Dr. Marieb also contributes to the University of Massachusetts at Amherst where she generously provided funding for recon-struction and instrumentation of a cutting-edge cytology re-search laboratory. Recognizing the severe national shortage of nursing faculty, she underwrites the Nursing Scholars of the Future Grant Program at the university. In 1994, Dr. Marieb received the Benefactor Award from the National Council for Resource Development, American Association of Community Colleges, which recognizes her ongoing sponsorship of student scholarships, faculty teaching awards, and other academic contributions to Holyoke Community College. In May 2000, the science building at Holyoke Community College was named in her honor. Marieb is an active member of the Human Anatomy and Physiology Society (HAPS) and the American Association for the Advancement of Science (AAAS). Additionally, while actively engaged as an author, Dr. Marieb serves as a consultant for the Benjamin Cummings Interactive Physiology® series. When not involved in academic pursuits, Dr. Marieb is a world traveler and has vowed to visit every country on this planet. Shorter term, she serves on the scholarship committee of the Women’s Resources Center and on the board of directors of several charitable institutions in Sarasota County. She is an enthusiastic supporter of the local arts and enjoys a competitive match of doubles tennis. Lori A. Smith received her Ph.D. in Biochemistry from the University of California at Davis. Before discovering her passion for teaching, she worked as a research scientist and project leader in the medical diagnostics industry. In 1999, she joined the faculty at American River College in the Biology Department. Currently she teaches anatomy and physiology and microbiology to pre-nursing and mortuary science students at American River College. Starting in 2005, she began co-authoring Pearson’s PhysioEx: Laboratory Simulations in Physiology and has continued to co-author several versions of the software and lab manual. Dr. Smith has been awarded “Instructor of the Year” by the American River College Associated Students for her commitment to serving students, and she is a member of the Human Anatomy and Physiology Society (HAPS) and the National Association of Biology Teachers (NABT).